In their latest films (that is Light the Wick and Deeper), Teton Gravity Research have, once again, found a pair of undeniable epics. Once again, TGR have definitively proven that if you leave a talented man with skis or board to his own devices at the top of pretty much any mountain, he will inevitably throw himself down it to produce spectacular results. Once again, as per the other twenty-eight award winning action sport films produced by Teton, these productions present a not-to-be-missed, limited release opportunity, this time screening at the Sydney Seymour Centre. Light the Wick follows the Teton crew as they demonstrate why they remain amongst the best of their fields internationally; exploring the vastness of the Petersburg ski fields in Alaska; blitzing the best of British Columbia (with a phenomenal stint of Heli-skiing in Washington); carving up the finest falls Croatia has seen for the past fifty years and exploring the undiscovered areas of the Italian Alps. This production is, cinematically, a frontier work, with the seamless integration of RED One Slow Motion scenes and aerial cinematography, fresh from the cutting edge of cinematic technology. Deeper is an account of the pioneer journey of elite snow-boarder Jeremy Jones and company through several of the untouched hearts of international snow-boarding. In the face of incredible adversity, this trip across America, Europe and as far south as Antarctica sees Jones camping atop peaks and enduring all night hikes , he and the other top free-riders brave twenty below zero and twenty mile days and ten day storms all sixty-five miles from civilization to produce some of the most insane and impressive boarding ever caught on camera. It proves that the sheer power of the human spirit is still able to overcome what many have suggested only snowmobiles and helicopters could, and then some. For the green members of the audience, it will come as a comfort to know that both of the projects are 100% carbon neutral. 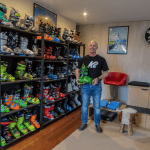 As an added incentive, three of the events major sponsors, Smith Optics and The North Face will be doing giveaways at both screenings, while Thredbo is offering a season pass at the premiere. The Australian premiere of both films is to be screened on the twentieth of May and tickets (at thirty dollars each) are available through the Seymour Centre box office; who are reachable online, by phone or at the door on the evening. Environmental conscience satisfied, the human imperative to win entertained and appetite for Winter-based action, get yourself to a screening at the aptly named Everest Theatre, just in time for the colder months.